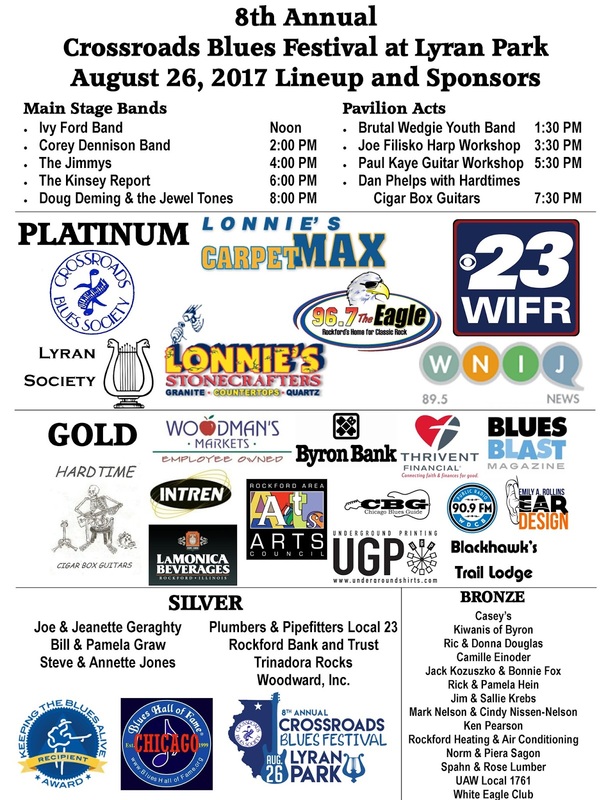 2018 Festival Lineup Set, Lonnie's Carpet Max and Stone Crafters Are On Board as Fest Sponsors! The lineup for the 2018 Crossroads Blues Festival has taken shape and it's finally official! We are excited to announce that our two headlining acts will be Toronzo Cannon and The Monster Mike Welch/Mike Ledbetter Band. Each band features a slightly different style of blues and an outstanding guitar player. 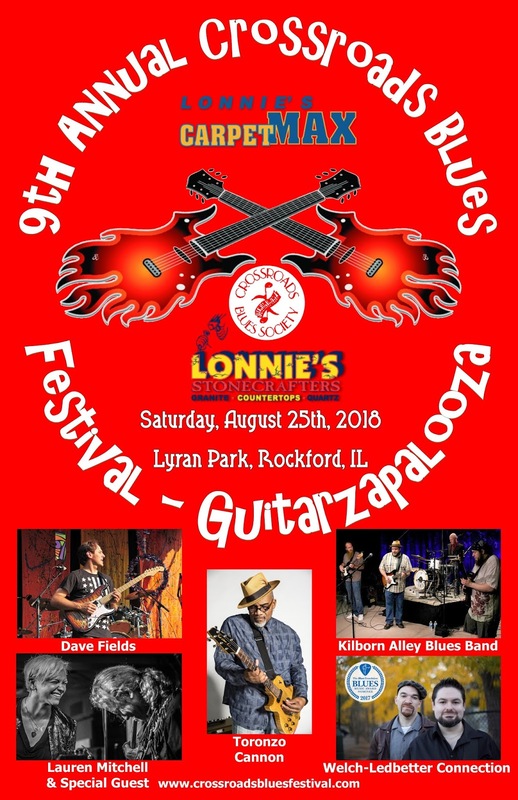 We are calling this year’s event Guitarzapalooza and this is all brought to you by Lonnie's Carpet Max and Lonnie's Stone Crafters! Toronzo Cannon is the hottest Chicago Blues act out there. His latest CD on Alligator Records The Chicago Way helped him garner four Blues Music Award nominations. His act features great original songs with timely lyrics delivered by a superb vocalist and guitar player. Toronzo has appeared twice in Rockford over the years and we are glad he is coming to play at our Festival! His latest show at the Hope and Anchor in Loves Park was a huge hit and showcased a night of mostly original tunes that had the big crowd on their feet and dancing! Monster Mike Welch hails from Boston, Massachusetts and has garnered accolades for his work with Sugar Ray and the Blue Tones along with his solo work and work in support of Anthony Geraci and other bands. He is regarded as one of the blues world’s premier guitar wizards. His album with Chicago area native Mike Ledbetter has placed their act in huge demand in the US and abroad. Mike Ledbetter is an operatically trained vocalist who returned to his blues roots. After spending a few years recording with and touring with the Nick Moss Band, he is out with Mike Welch delivering amazing performances showcasing his amazing voice. He also is a damn good guitar player. We really are looking forward to their first show together in Rockford. Opening the day will be New York City blues rocker Dave Fields. Dave and his band have been a vital part of our blues in the schools program for several years. They come out twice a year to put on school programs for us and schools have asked for him to come back for more programs. He also appears regularly for us in the evening at venues like the Lyran Society and the Hope and Anchor. His music spans the blues, rock, jazz and other genres and is a lot of fun! After Dave we have Kilborn Alley coming to the big stage. Based in Champaign, guitar players Andrew Duncanson and Josh Stimmel offer two different styles of guitar work. Andrew is also the vocalist and delivers soulful and gritty performances. Their recent Tolono Tapes CD garnered lots of interest during awards season. Their 2017 show at Sinnissippi Park was highly regarded and we are happy to have them back! Florida’s Lauren Mitchell brings her powerful voice to our stage in the next time slot. This will be Lauren’s first visit to Rockford. She has played at Buddy Guy’s Legends and in nearby Bellvue, Iowa to rave reviews. Her soul blues album Desire was well regarded and got lots orlf airplay. Touring with Lauren is a surpise special guest guitar player. It should be one heck of a great show. Between acts will be our IBC entry youth act Riding Atlas and our IBC solo entry Warren Beck. Riding Atlas is the new name for yBblu, the great band from Galena. Featuring the Dicklin brothers Nicolas and Joseph on guitar and bass and Sam Petri on drums, they are a rocking good time. Warren is a fantastic singer and piano player who hails from Lake Forest, Illinois. His rollicking, barrelhouse style will delight our attendees. Joe Filisko will also return for a harmonica workshop. This will be his sixth workshop in none festivals and we are always excited to have him back. This Joliet based harp player and tinkerer is a superb artist and teacher. We will also feature a Blues i the Schools workshop with Wheatbread Johnson, a great local talent who teaches guitar at Rock Valley College and who just released a brand-new CD. Once again advanced tickets will be only $5. 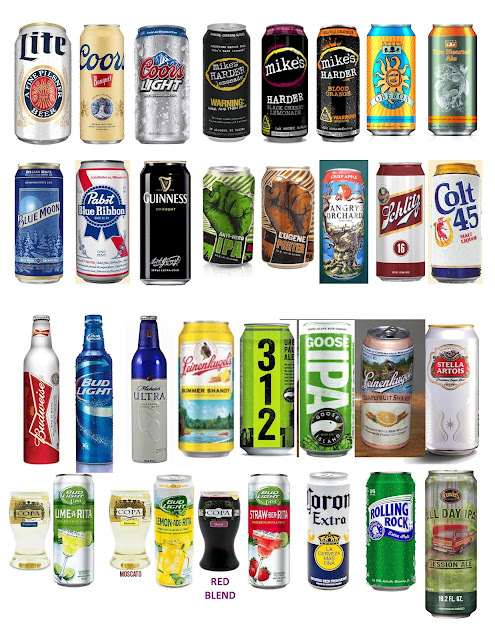 Tickets at the gate remain $10, beers are still $4 and pop and water only $1. We have also added wood fired pizza to the BBQ and other great foods offered. Great music, beverages and food for a reasonable price- what a great day it will be! 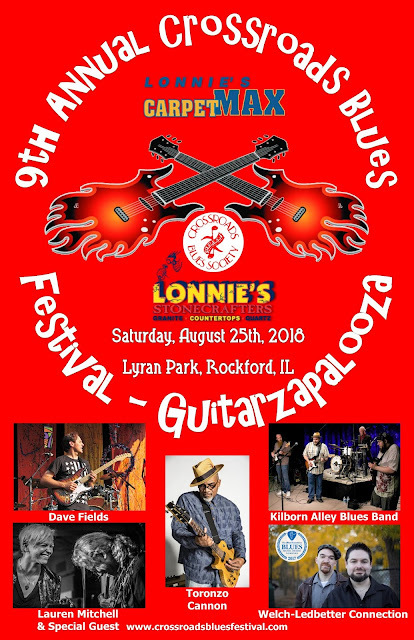 Our ninth annual event returns to the beautiful Lyran Park in Rockford on South Bend Road, near the Rockford Airport. We adding lighting to the parking lot to facilitate exit at night and golf cart service for handicapped and elderly will be expanded to go up and down the hill. If you have a large group you are welcome to bring a small pop up tent and put it near the hilltop or to the right of the stage near the river and woods. Call 779-537-4006 or email sub_insignia@yahoo.com for more information. 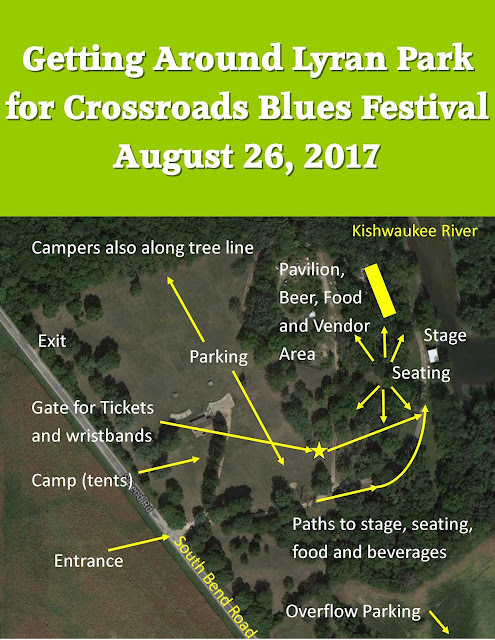 Our festival website is www.CrossroadsBluesFestival .com and Society website ishttp://crossroadsbluessociet y.com/. 2017 Festival Was Our Best Yet! Ticket sales topped all other years and attendance was the best yet! The crowd was into the bands, beer and food! Thanks to all who came out to support the blues and live music! It was a great time and we'll continue to try to make it better and better every year! Here are some great photos by Rick Davis, Crossroads Board Member! 2017 Blues Blast Music Award Winner Announcements and More! 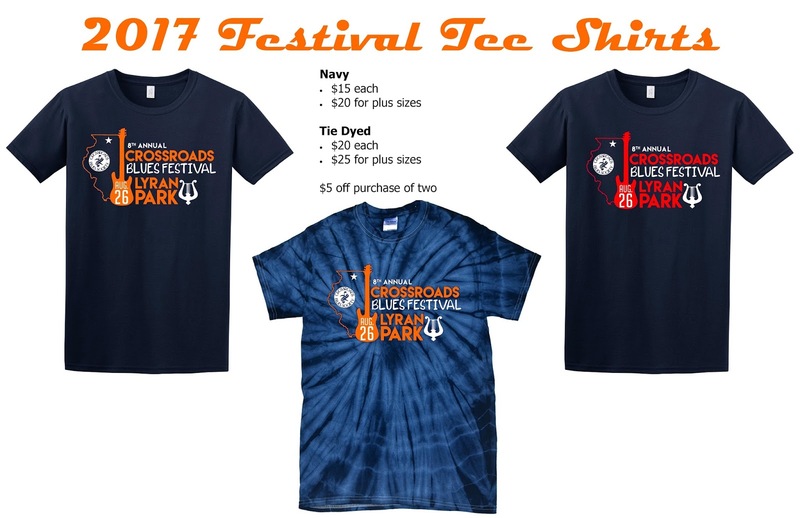 Bob Kieser, editor and owner of Blues Blast Magazine, will be there and the awards will be announced by Bob, Steve Jones (Crossroads President, Blues Blast writer), Mark Thompson (Sun Coast President, Blues Blast writer, Blues Foundation Board), Linda Cain (Chicago Blues Guide) and Amy Brat (Brat Girl Media). The date and location for the 2018 BBMA Award Show will also be announced. I think area residents will be very excited to hear about this! One last major announcement will be a new scholarship that Crossroads will be awarding each year beginning at the end of the 2017/2018 School Year! This will be done at 3:30 PM on the Main Stage. Rain or shine means just that. The show must go on! The weatehr reports is looking fine!!! Lyran Park is a beautiful setting. The stage is on the bank of the Kishwaukee River just before it flows into the Rock River. The part rolls gently up a nice, slight grass-covered slope. The park is covered in mature hardwood tree with great shade while not interfering with sight lines. No outside coolers, food or beverages please (dietary restrictions excepted). Please bring chairs or a blanket. No pets, please. Service animals are allowed. No seating on pavement; dancing only! No golf carts will be driving on pavement or grass in front of stage while bands are playing. Camping is $20 per night (Friday and/or Saturday). 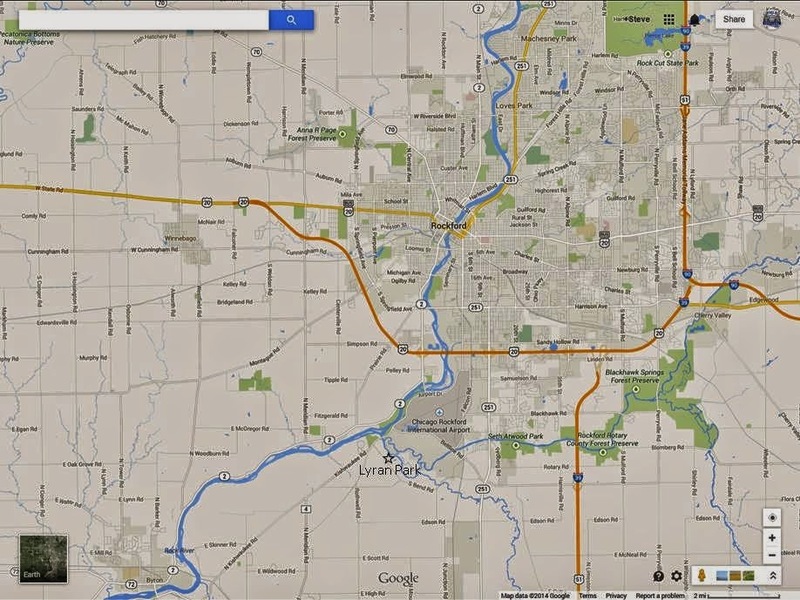 Watch for us on Rockford's CBS Affiliate WIFR Channel 23 and their subsidiary channels!